used: Dreamworld minerals toppings in Butter Creme, Blusche foundation in Colombian, MAC Sculpt and Shape on the nose, MAC blush in Dollymix, Joppa minerals concealer in Medium on blemishes and Smashbox lipstick in Sweet topped with MAC gellee in Dewy Jube. it's my first time to wear my mineral foundation from BLUSCHE. And i just want to say that i love it! Colombian is a light neutral shade and i think it's a good match (dont you think so too?). It has a very smooth finish and did not cake even though i think i've used too much. Staying power is good too and kept my oilies at bay esp. on my cheeks. 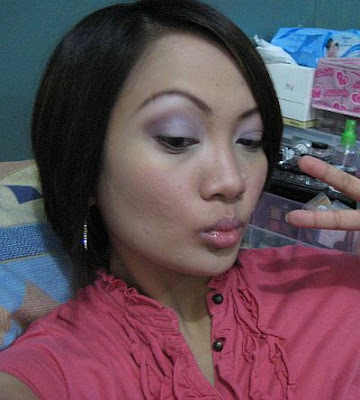 I still used a couple of oil blotting papers after a few hours but only on the t-zone. An officemate even asked me if i'm wearing foundation because according to her, it looks like i'm not wearing any. WHOA! Now, i'm lemming to get their primer and finishing powders too! tsk tsk, too bad i'm on a no-buy. I've been complaining about the paintpots drying up too quickly on top of my UDPP. So i've tried using it alone on my neutrals eotd. 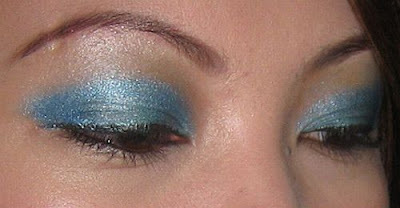 This time, it didnt dry up that fast because i was able to blend it well on my lids. I was happy about it and told myself that i would no longer need to give up on my paint pots (i was actually thinking of selling them) but after a few hours (2-3hrs) i saw my e/s already creasing! waaahh. with UDPP, my e/s stays put for a day! i also tried UDPP then topped with MAC PP and it did a great job in making my e/s crease-free for hours but i'm really having a hard time blending my PP and eventually, my eyeshadows. i was told that i would need to use a brush for these PP. currently i'm using my fingers...but i also tried using a synthetic brush and it's just the same, PP dries up too fast. :( i wanna keep my paintpots (i only have two, though) because they serve as a good e/s base but i would need to figure out a way to make them work with my UDPP. how are you applying the PP? are you sweeping it across your entire lid? 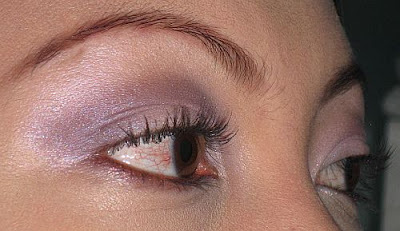 i don't use PP, but i have the indelible creme eyeshadow (which are pretty similar). i found that they tend to dry fast, also, so what i do is just dab it little by little and blend along the way to even out the texture. i use the wet/dry brush from silk naturals, and it works well b/c it's flat & synthetic. oh, yeah. i also wanted to mention that i really like your neutral look. it doesn't make you look older at all. yes, i agree it dries up fast but it doesn't crease on me with the UDPP. :) applying it with brush helps. i use the one from luminare. synthetic taklon brush. if by using p/p without UDPP you can blend it better, then foil your e/s sis. that's what i do kasi and it doesn't crease. ayan na naman tayo sa foiling noh? lol. still having problems about that ba?